Ahh....blissful ignorance. 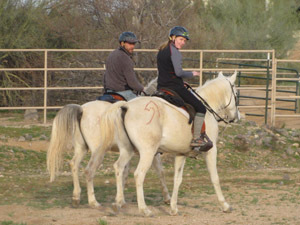 Pictured (here) is my very first ride on Minx. I made horsey and endurance goals for 2009. Admitting to doing this absolutely silly since none of my endurance seasons have gone according to "plan". Endurance riders seem to have a phobia against pulls and marring their "perfect" record. Fortunately I got that out of the way early. Please don't be ashamed of your pulls. Not only are they learning experiences for you, but they could be learning experiences for others if you don't hide them away in a deep, dark hole. I offer the following case studies as a source of amusement and reassurance to anyone who has done similar things. 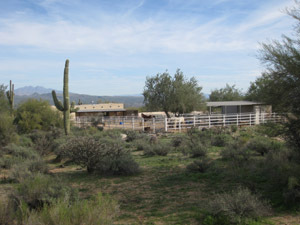 This is the fourth winter that we've descended upon Rusty and Kevin at their desert home in Scottsdale, Arizona, Gotta Go Ranch. Year one was 'let's try Arizona - something new and different'. We left for Scottsdale together following a most memorable News Years Eve party and dance (-if you can't find a dance partner just grab a chair- was the theme for the evening) after the final day of Death Valley Encounter 2004 (a live country band and flowing Tequila made the night memorable and festive, though some of the memories are a little fuzzy, but then those grainy videos that John took proved that indeed those 'did I really do that?' moments did happen :). For those who don't know Kevin and Rusty, they are two incredibly generous, gracious, and life-loving guys whose career paths recently brought them to Phoenix. Rusty is a ballet dancer who grew up in Detroit and began taking dance lessons at a young age to correct a spinal condition - he loved the dance, and early on decided to pursue a career as a professional ballet dancer. Rusty retired this year from performing, and he now teaches ballet and has found a second career as a yoga instructor. He is incredibly talented, and we keep telling him he is 'guru material'. It will be fun to see how far he goes with his new career. Kevin is a British-born-Canadian-citizen who spent his youth searching for the meaning of life and eventually his charm, wit, business acumen and love of a challenge - as well as a series of life-coincidence events launched him into the world of ballet at the administrative level. His ability took him to the top - Montreal, and Vancouver, and finally Phoenix, where 5 years ago he was offered the job of executive director of the Phoenix Ballet. We first met Kevin and Rusty in 2000 at the Fort Howes ride in Montana. Rusty and Kevin and another ballet-endurance riding friend were doing a pokey 100 (Rusty's first 100) and I was doing a zippy 100 (a first place and BC for Kruschev, his demonstration ride for the Compiegne WEC). We happened to share a table together at breakfast the morning after and shared laughs over our different rides (me first, Rusty last) and the wonders of doing a 100 at any speed and the feeling of accomplishment simply to have finished a 100 ('Go Motto!'). (To Finish Is To Win). Since then they've been dear and easy friends, the kind of friendship that you can just slip back into at any time. They open their home, and corrals and find room for us and whatever beasts we bring with us. So once again (and again and again) we're back, enjoying a spectacular winter '09 here (above average temps, sun sun sun) and watching the Sun Worship Gang grow. Two years ago friends Jim and Clydea Hastie came to visit us here at Gotta Go Ranch. 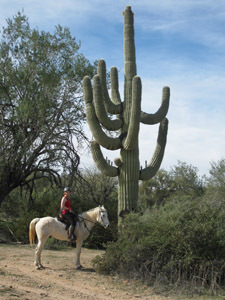 They had tried other warm weather escapes such as Yuma, Ca. , but after meeting Kevin and Rusty and seeing everything that Scottsdale had to offer they decided to buy a house and move down here (from Idaho, where they had been subdividing their ranch and selling lots) permanently. No more snow! And then Gene and Sue Nance moved down from Oregon last year. The circle of endurance riding friends is growing. This year Brian and Darla Malkoske decided to test the 'winter down south' theory. Brian is a long time friend of K & R from British Columbia, and it's been great to have them down here! Good spirits, easy going, good company, good cooking (Darla, not Brian :) and it's been a wonderful mix of personalities. And then Rusty's 'long lost' cousin Ali came for a long weekend, on break from college in Colorado. And two days ago Sandra Fratellier (sp) came for a week. Sandra is French transplant, living and working in New York City as a photo retouch artist for the past 5 years, and commuting on weekends to NJ where she is boarding her endurance horse. She and Kevin became friends on Facebook, and now here she is! Fun and easy and fitting right in. The thing about doing the 'sun thing' is that it seems to stay with a person for weeks after - like a tan - something to look at and make you remember the feel of the sun on your skin when you're back in the wintry world. There must be a brain hormone equivalent of melatonin - close your eyes and remember trotting through the sand washes with the cactus and blue sky horizon, and transport back to a warm and sunny moment, and feel better just for remembering. We FINALLY got snow this winter! Soft, powdery, luxurious snow! 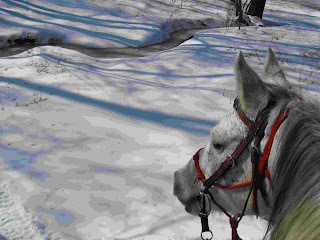 And even better - it was the perfect texture to go riding in, not too slippery, not too crunchy. And Saturday was perfect riding weather - the sun was out, barely a breeze and warm weather - one HAD to go riding. Or that's what I told my horse, the look I got in return made me think she didn't agree :). But after two weeks off braving the cold and not doing much but eating hay, she could use the exercise. So off we went to the trails. I was excited - no trail markings to follow, it would just be us and the snow, bushwacking through the trees. Where you going? Can we go? What are you going to do? What are the trails? We never get to go anywhere! DB Kalif, too mature for these young colts, hung out in back, too grown up to be impressed by our little adventure we were going on :). Our little ditch we normally jump was now a frozen creek. With all the tracks we saw, it would seem inevitable we'd run across some critters, but no such luck. Posting photos here to show the climbs we did, and also Chief’s heavy winter coat - i was melting without a coat so I know the horses with coats on this ride were working *really* hard. Even some of the SoCal horses were clipped or partially clipped. What a relief that we made it safely and healthy through this ride with that much winter fur on. There were 26 riders today with Julie Herrera finishing first. I don’t know who got BC (sorry, the superbowl was on) though I know Julie’s horse looked really good. The other horse in contention was Jonathan Bowman’s. So it was either one of those. Chief and I finished in 5th place. I don’t think we’ve top tenned in ages - it’s certainly not high on my priority list but today we just managed to get into our own space and I was able to let him trot at a pretty reasonable 8 mph trot through a lot of the trail and we had a really nice time. He really is great on those kinds of trails and even though he hadn’t been out earlier to mark trail followed them precisely even when I wasn’t sure where a turn was. I really don’t know if I am subtly cue-ing him and not aware of it, or if he is just reading my mind. He is so reactive and quick about making tight turns with so little effort on my part. I love that about him. I have to give him some credit since he did spook at a big boulder when we were trotting through a neighborhood today - not normalfor him, but I think it snuck on him and he wasn’t expecting it! Silly boy. He got lots of points for not caring at all about the snakes (see photo, lol), mattresses, abandoned cards, shooting range or the dozens of barking dogs chasing us through fencing. There were 30 riders the first day of Bar H with 28 finishers. First was Suzie Kelly with a ride time of around 5:15, and BC was Jonathan Bowman. The weather was fabulous, very warm (hot for those of us not from around here–around 80’s) with beautiful blue skies. Today was the hardest endurance ride that Bo has ever completed. Dave Rabe said this was also the hardest ride his horse (White Cloud) has ever done. 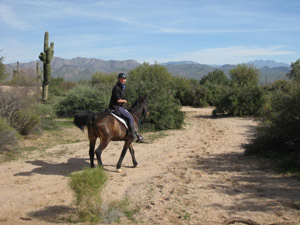 Course both of our horses are ‘newbies’ and only have around 600 to 700 miles each. We had a really nice ride that went well from start to finish. 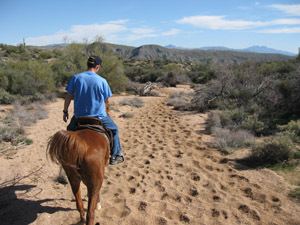 I was glad that I changed my mind about which horse to ride today - it did help that I rode Bo to help mark trail the day before to get the edge off of him. He was really well behaved all day today and did a super job taking care of himself. I was pretty pleased with Bo’s performance and especially his want-to-go attitude. 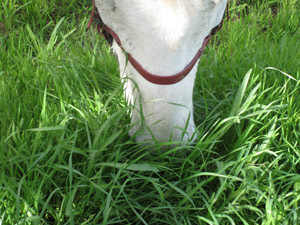 Especially when we left lunch and Chief was running around in the corral screaming and Bo never looked back, or looked up during lunch while his head was tucked down eating. Then again as we were leaving camp for the third loop and again Chief was running around whining about the entire situation - Bo just boldly trotted forward and without even thinking about what he was leaving behind in camp. Which really impressed me because like I said, this was the most challenging ride to date that Bo has done.